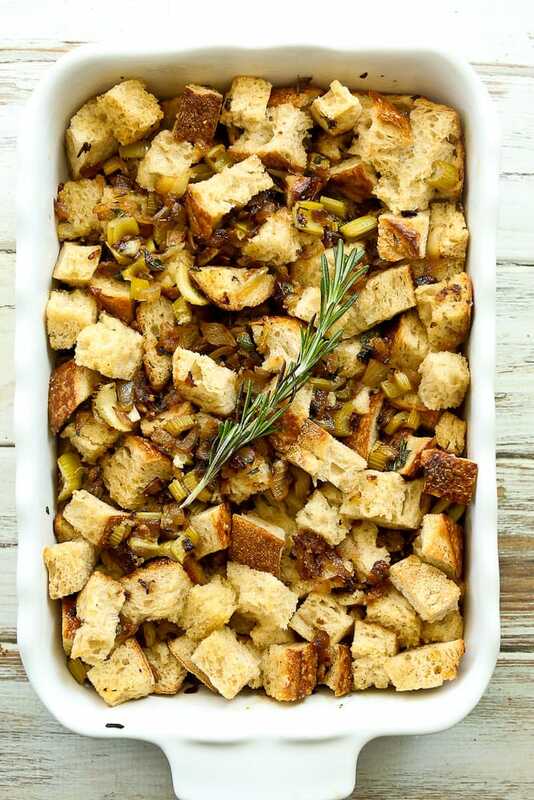 This Easy Sourdough Stuffing Recipe is vegetarian and can be prepared ahead of time! Ah, stuffing. In so many American’s minds, it’s the star of Thanksgiving. What’s not to love? The bread-y, herb-y baked goodness is worthy of all the admiration it receives. I want to show you how to make a traditional stuffing recipe from scratch without much fuss at all. This is a pretty classic stuffing recipe–no trendy twists or frills, just exactly the stuffing flavor and texture you crave around the holidays. Sourdough bread is called for in my recipe. I use it for a few reasons. Sourdough is definitely the superstar of the bread world nutritionally. 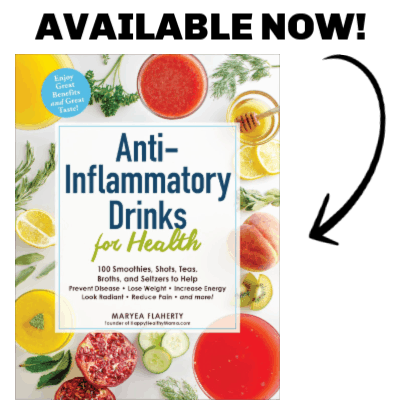 Sourdough is a prebiotic, which helps support the gut microbiome and is one of the easiest breads to digest. Aside from the health benefits, sourdough is just good and I love the flavor it brings to the stuffing. 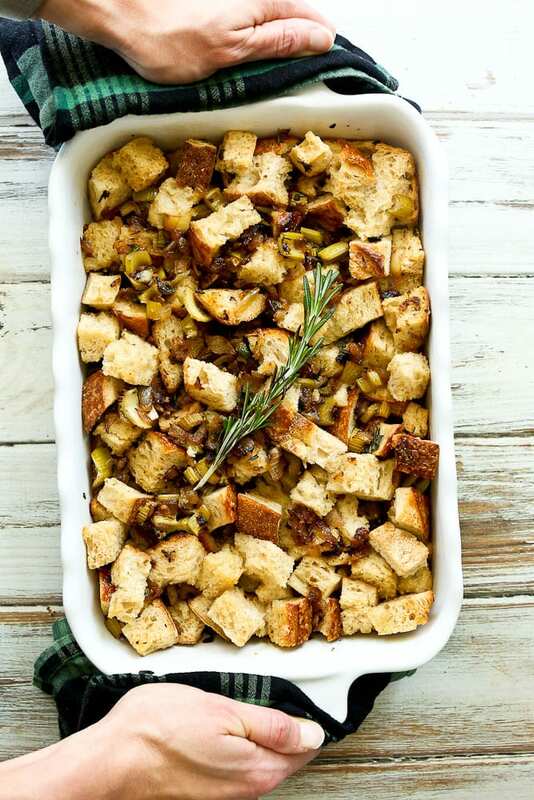 If you aren’t a fan, you can substitute a rustic loaf of country white bread or your favorite whole grain loaf to make it a whole grain stuffing. What are the ingredients for stuffing? How do you make the best homemade stuffing? There are simple steps for how to make the best homemade stuffing. Follow this outline and you’ll be the hero of Thanksgiving because you made the best stuffing ever! Dry the bread. Stale bread isn’t quite what you’re looking for here. Your bread needs to be dry and hard. I find drying it in the oven is the best bet. After you dry your bread, place the cubes in a large bowl. Sauté your vegetables and herbs. Add the vegetable mixture to the bread cubes. Melt some butter in the same pan that you sautéed your vegetables. Scrape up any brown bits (FLAVOR) and then pour the butter over the top of your stuffing mixture. Pour the butter over the top of the bread and vegetables. Add the broth and gently toss the mixture. Transfer the mixture to a lightly greased baking dish and bake in the oven. 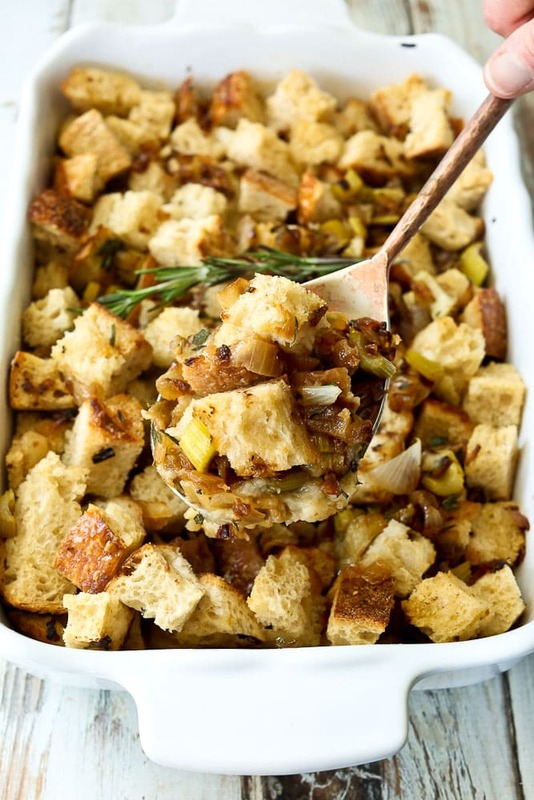 This easy Sourdough Stuffing recipe is a classic Thanksgiving stuffing that is vegetarian, simple to prepare, and always a HIT. Dry the bread. Place your bread cubes on a large baking sheet and bake at 275 degrees until dry to the touch, but not toasted/brown, about 30 minutes. Allow to cool and place the cubes in a large bowl. In a large skillet, heat 2 tablespoon avocado oil over medium heat. Sauté the onion, shallots, and celery until soft and starting to brown, about 10 minutes. Add the garlic and sauté another 30 seconds. Add in your fresh herbs and cook another 30 seconds. Add this mixture to the bread in the large bowl. In the same pan, melt the butter. Scrape up any browned bits and then pour the butter over the top of the bread and vegetables. Add the broth and gently toss the mixture. Transfer the mixture to a lightly greased baking dish (9 X 13″) and bake in the 350 degree oven, covered with foil, for 45 minutes. Uncover and bake an additional 10 minutes. Enjoy!